Should governments be involved in economic affairs? Challenging prevailing wisdom about the benefits of self-regulating markets, Nina Bandelj and Elizabeth Sowers offer a uniquely sociological perspective to emphasize that states can never be divorced from economy. From defining property rights and regulating commodification of labor to setting corporate governance standards and international exchange rules, the state continuously manages the functioning of markets and influences economic outcomes for individuals, firms and nations. The authors bring together classical interventions and cutting-edge contemporary research in economic sociology to discuss six broad areas of economy/state connection: property, money, labor, firms, national economic growth, and global economic exchange. A wealth of empirical examples and illustrations reveals that even if the nature of state influence on economy varies across contexts, it is always dependent on social forces. This accessible and engaging book will be essential reading for upper-level students of economic sociology, and those interested in the major economic dilemmas of our times. "Economy and State offers a wonderful introduction to the burgeoning fields of economic and political sociology, and in particular to work at the dynamic intersection of those fields. Why do labor markets, financial markets, and stock markets take on different forms at different points in time, and in different countries? What public policies and regulations are essential to the operation of these markets across settings? Bandelj and Sowers' sweeping overview shows how governments structure all aspects of the economy, large and small. Everyone interested in understanding economic behavior should read this book." "This smart, accessible book surveys a vast and complex terrain with clarity and insight. 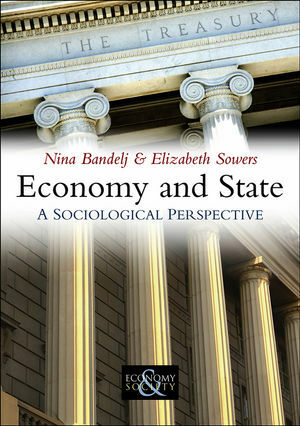 From the workings of monetary and fiscal policies to debates regarding the welfare state, from the origins of neoliberalism to consideration of the determinants of economic development, among many other topics, Bandelj and Sowers offer a lucid overview of key issues pertaining to the state's role in constituting the economy in contemporary society. With clear explanations, broad coverage, and a comparative emphasis, this book will provide an extraordinary resource for teaching." "In a world where too many people really believe there is an invisible hand coordinating economic activity, this book will come as an accessible and concise discussion of the many ways in which states are involved in the distribution and exchange of economic goods. Bandelj and Sowers have written a welcome review of the relationships that different state forms have with economic orders." • A uniquely sociological perspective on economy and state connections which emphasizes that states can never be divorced from economy. • Demonstrates how states play important roles in the economy from the individual to the international level, from personal taxes to global financial governance. • Examines five key areas: money, labour, firms, national economic growth, and global economic exchange. • Brings together classical interventions and cutting-edge contemporary research in economic sociology.